Just over one year ago, on September 2016, Microsoft Philanthropy announced it would offer a yearly $5,000 Azure credit to nonprofits around the world, making the powerful cloud computing infrastructure much more accessible to the nonprofits sector. According to Microsoft, Azure is a growing collection of integrated cloud services—analytics, computing, database, mobile, networking, storage, and web—for moving faster, achieving more, and saving money. Azure is a cloud computing platform and infrastructure for building, deploying, and managing applications and services through Microsoft's cloud-based technologies. Azure provides both PaaS (Platform as a Service) and IaaS (Infrastructure as a Service) and supports many different programming languages, tools and frameworks, including both Microsoft-specific and third-party software and systems. What's the Difference between Iaas & PaaS? 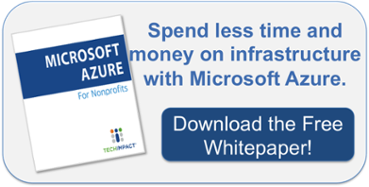 Curious about how Microsoft Azure for Nonprofits could work for your organization? Contact us.